The demand for mountains by visitors to Trentino, is constantly growing. The desire for clean and uncontaminated places, for peace and quiet and for relaxation and physical health is realized among the peaks, meadows and forests in wide open silent places. A mountain that an increasing number of tourists and holidaymakers wish to experience and enjoy (in contrast with the seaside that is more and more polluted and chaotic). This may explain the boom registered in the recent summer seasons. Those who want a mountain holiday have no end of possibilities to choose from in Trentino. Every valley resort, whether large or small, has its own special features and can offer a holiday made to measure. Holidays here range from simply walking on the over 6 thousand kilometres of carefully maintained paths to high altitude ascents on rocks and ice along prepared routes; from outings of a few hours to long traverses that take several days. Trentino offers an infinite number of possibilities with one prevailing feature: a landscape which changes according to height and area, but is always extremely captivating. The 141 alpine refuges lie in strategic points in the Trentino mountains and 39 of them belong to the SAT and others are privately run. These, all together, provide over 4 thousand 500 beds. In the light of the new trends, characterized by a strong "demand for mountains", these alpine refuges have become outposts in the Province of Trento for experimenting technological innovations to cope with problems caused by man in the mountains. Our highlights regarding trekking hiking via ferrata at Lake Garda or in the Dolomites or on the Greek Island Kalymnos have not been chosen by our alpine mountain guides school but are the preferences of our customers in the 20 years of our activity. Please click on the image for a complete program of our trips and courses. With our proposal of the Brenta Trek Italy, we would like to offer a 5 days trekking trip from lodge to lodge crossing from the South to the North, the entire Brenta Group, with overnight stay in the mountain lodges, suitable for everybody. 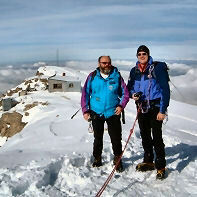 The participants only need to have a good physical condition and some experience in hiking trips in the mountains. This via ferrata course at Lake Garda is destined for people who love trekking or mountain walks, and for whom who would like to try themselves in the vertical world in complete safety. The rock climbing experience of this day is very important for the performance of our via ferrata courses and trips. The next two days we will climb the most beautiful via ferratas in the Lake Garda Italy area. The top of Marmolada Dolomites is the famous and the via ferrata on the Western Crest is a dream of many mountaineers like the "Normal route" of Mont Blanc. The via ferrata on the crest of Marmolada is classified as difficult but as always the difficulty at high altitude depends on the environmental conditions which can vary extremely in the mountains. Obviously for this type of via ferrata trip it is necessary to have a good physical condition and sometimes even the use of the rope is necessary. Every time we are fascinated by the views, wildness and solitude of this territory. On Kalymnos Island in Greece we can hike many hours meeting only goats or take a swim in a solitary bay. The program of our Trekking hiking School Arco lake Garda consists of five days hiking on the Island and one day is destined for an easy rock climbing experience or rest. We sleep in the best hotel on the Island and we will choose the most traditional good restaurant. We will make possible the best trekking vacation come true, not only in Greece! The Brenta group is similar to the more famous Eastern Dolomites but the rock walls and pillars there are bigger, the environment harder and wilder therefore less touristic and more alpine. Through these multicolor fantastic walls runs the famous track of "Via ferrata Bocchette del Brenta" which is ideal to exercise our via ferrata courses and trips in the Brenta Group. This course is destined for people who have a little experience in high mountains or via ferrata or for very athletic and adventurous participants. Overnight stay in the mountain lodges.